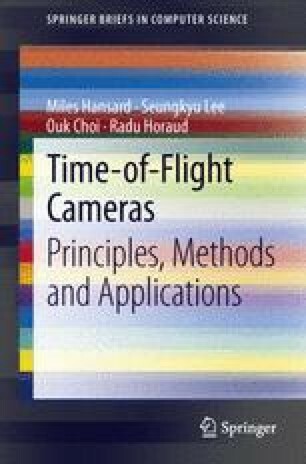 This chapter introduces the principles and difficulties of time-of-flight depth measurement. The depth images that are produced by time-of-flight cameras suffer from characteristic problems, which are divided into the following two classes. First, there are systematic errors, such as noise and ambiguity, which are directly related to the sensor. Second, there are nonsystematic errors, such as scattering and motion blur, which are more strongly related to the scene content. It is shown that these errors are often quite different from those observed in ordinary color images. The case of motion blur, which is particularly problematic, is examined in detail. A practical methodology for investigating the performance of depth cameras is presented. Time-of-flight devices are compared to structured-light systems, and the problems posed by specular and translucent materials are investigated.